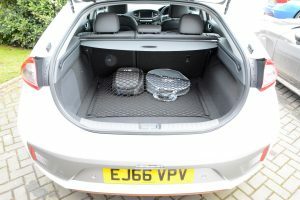 We’ve already driven the Hyundai IONIQ Electric on its UK launch and we were impressed; but did this image remain after living with the car for a week? 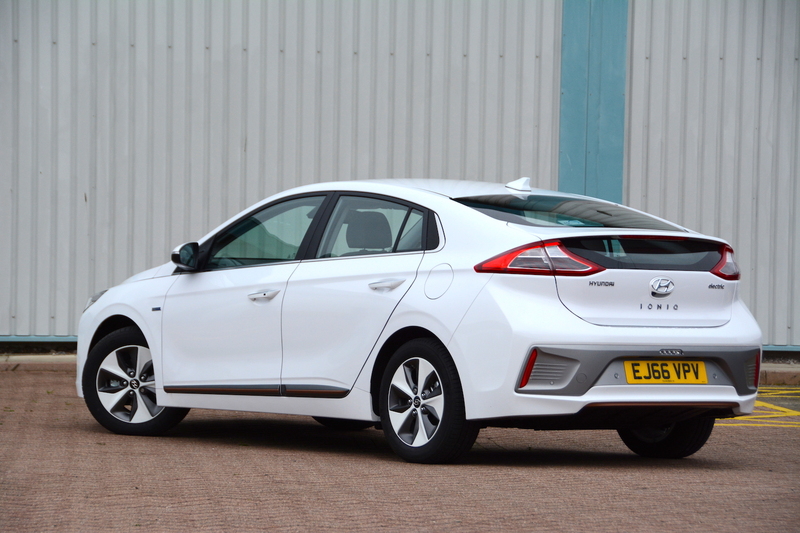 The IONIQ comes in one body style, but with three powertrain options – hybrid, plug-in hybrid (goes on sale in the UK soon), and electric. The five-door hatchback body is practical, and it can seat five people. 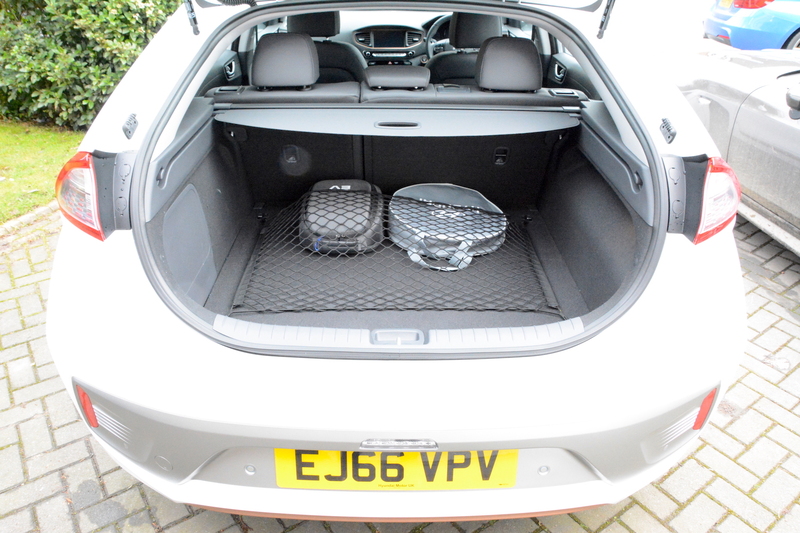 There’s a reasonable-sized boot, although the two charging cables take up a fair amount of space. The dashboard is functional but perfectly acceptable from a visual point of view, with lots of clear switches. On the outside, the IONIQ’s side profile shares a similar shape to that of a Toyota Prius – a design that owes much to the wind tunnel. The front of the car is basically fine, except for one thing – and in our view it’s the only thing that spoils the entire car – the IONIQ Electric has an area of grey plastic covering the area where the grille should be. Such a styling detail could be said to be subjective, however during the course of a week with the car, ten people passed comment on the front of the car, and ten out of ten said that they didn’t like this frontal treatment. We think it would look better if the contours of the grey plastic were more sharply defined, rather than it looking like the grille has been hastily covered with a piece of material. Out of all the colour choices for the IONIQ, silver is probably the best to tone down the grey area of plastic. Due to the styling of the front of the car (and to an extent the wheels), the IONIQ Electric looks like an eco car – along the lines of the Kia Soul EV, but not quite as extreme. In our view, it would be more successful if it looked liked a normal car. 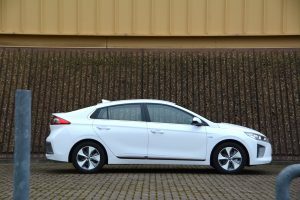 In terms of powertrain, the IONIQ Electric has a 28 kWh lithium-ion polymer battery and an electric motor with a maximum output of 88 kW (120 PS), resulting in instantly available maximum torque of 295 Nm. In normal driving, the Hyundai IONIQ Electric is perfectly pleasant to live with. There’s no clutch or gears, so around town it’s easy to drive, and it’s quiet, refined and responsive. On the motorway it’s a similar story. But it’s on A and B roads when you may be surprised by the IONIQ. The battery sitting in the floor means that the IONIQ Electric has a low centre of gravity, which results in good handling, and its electric powertrain means that 100% torque is available at virtually any speed, which results in responsive acceleration. These two factors combine to deliver an excellent driving experience, as the car feels powerful, and it negotiates corners with minimal roll. 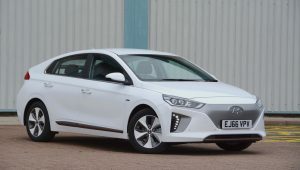 Although the IONIQ delivers impressive handling, it also has a comfortable ride, doing a good job of cushioning the occupants from the impact of poor road surfaces. Because of all the torque, if you need to accelerate enthusiastically to get out of a junction quickly in the wet, the traction control system has to dial back the delivery of drive to the front wheels. However you can switch off the traction control. Doing this results in a car that is more fun to drive than you might imagine. 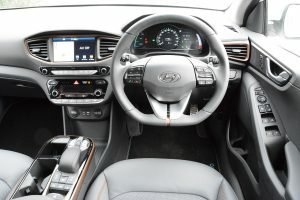 If you then select Sport mode, in preference to the other two drive settings of Normal and Eco – then the combination of wet roads, deactivated traction control, lots of torque, front tyres that aren’t the grippiest in the business, and Sport mode really can provide some entertaining driving dynamics. 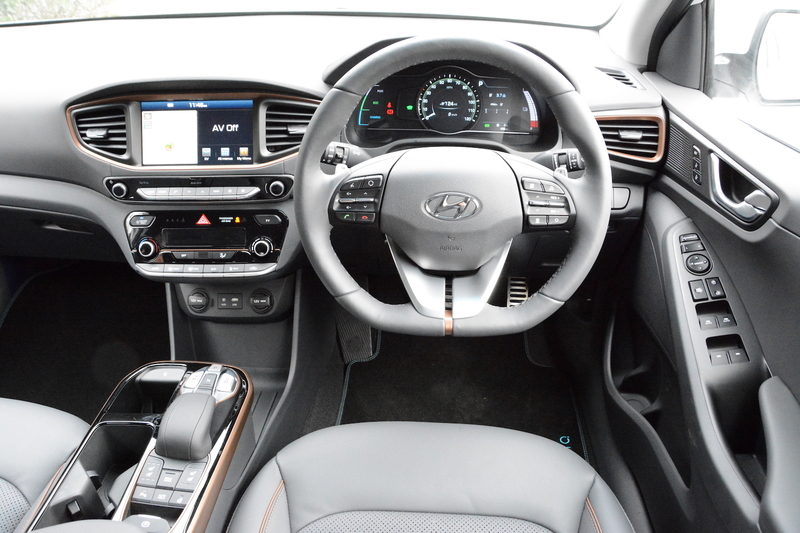 The driving experience is helped by a steering wheel that feels sporty and upmarket. Life could be even better with a traditional gear selector, but instead you get three buttons for Drive, Reverse and Park – which are not as intuitive or as satisfying as pushing a lever forward or back. You do get steering wheel-mounted paddles – but these aren’t for changing gear, instead they’re for adjusting the level of brake regeneration – from level zero to levels one, two or three. This is a useful feature and BMW should adopt a similar system in the i3. The steering wheel is heated, and there are heated seats. You can also select a ‘heat’ button to ramp up the cabin temperature, as well as selecting just the driver’s zone for heating. So all in all, the IONIQ was a very comfortable electric car to live with during a week in February when temperatures barely rose above freezing. This can’t be said for a number of other electric cars that we’ve tested, as the heating in electric cars is usually dreadful. Another area that’s typically different with electric cars is braking feel, and the IONIQ is no different – the brakes take a while to get used to compared to a conventional car. The IONIQ has very clearly-marked switches – which also have a quality feel to them, the satnav mapping has excellent graphics, and the reversing camera provides a very sharp view. The big question with electric cars is not what miles per gallon you can get out of them, but what driving range will you get in real life? The official driving range of the IONIQ Electric is 174 miles. We had the car on test in early February when the temperature was hovering around zero most of time, and the range in the morning was typically displaying 125 miles. 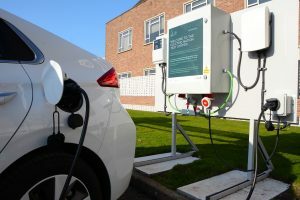 On the launch in October the car was displaying 130 miles when fully charged, so these are likely to be the two worst case scenarios. Having a minimum of 100 miles of driving range every time you come to a fully charged car is essential to win more people over to buy electric cars – but it should be noted that the latest Renault ZOE has a 250-mile range, so the IONIQ is already playing catch-up. And of course the IONIQ has zero tailpipe CO2 emissions and zero particulate and NOx emissions. The whole world is finally waking up to the importance of local air quality, so the IONIQ scores full marks here. As well as being greener, running costs for an EV are around a fifth of the cost of a petrol car. A full charge at home using a charging unit takes four and a half hours. 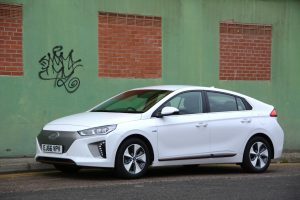 The IONIQ Electric Premium SE is available from £26,295 after the UK government plug-in car grant of £4,500. 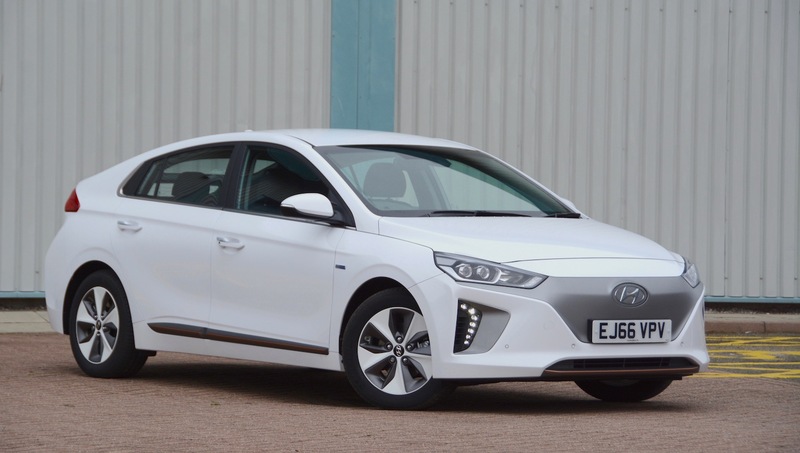 The other trim option is the IONIQ Electric Premium, available from £24,495. 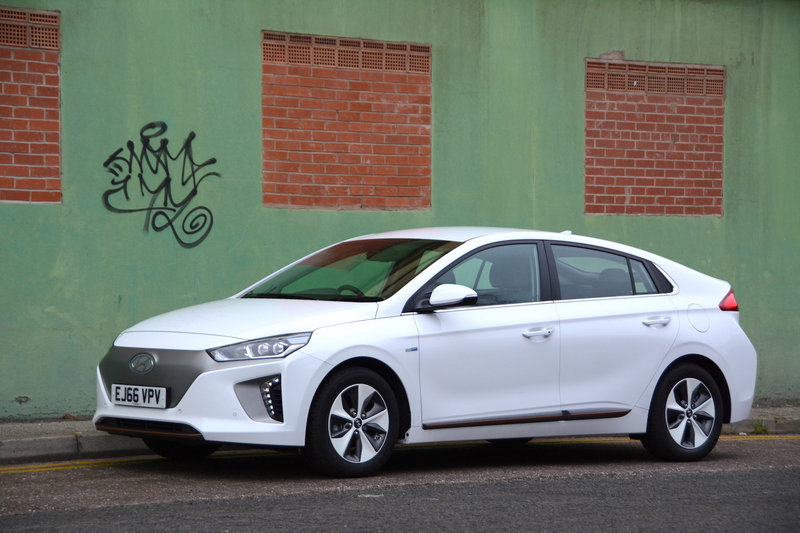 The IONIQ Electric has just a 7% BIK rate for company car drivers, and it’s exempt from the London Congestion Charge, meaning an annual saving of £2,886 over a car that emits more than 75g/km of CO2 driving into central London every day. All versions of the IONIQ are available with an industry-leading warranty package that features Hyundai’s unique Five Year Unlimited Mileage Warranty on the vehicle and eight years and 125,000 miles on the high-voltage battery. There’s also the IONIQ Hybrid, and a plug-in Hybrid will be coming soon. 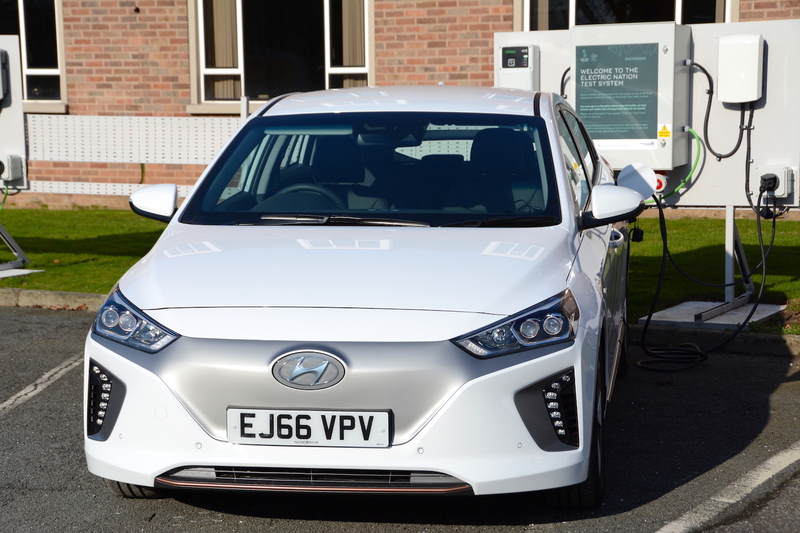 We really like the Hyundai IONIQ Electric. It’s great to drive – more fun that you would imagine, and it has a decent real-world driving range – probably of a minimum of 125 miles. It’s a practical five-seater hatchback and it’s an efficient body shape. It’s also relatively affordable. But of course the main selling point is that this is an electric car, so it has zero tailpipe emissions. This is important for CO2 emissions, but today it’s even more important in terms of emissions that impact upon local air quality. Doing the school run in a diesel after doing it in the IONIQ feels decidedly dirty. There are few other cars that combine all these selling points. So it’s a shame that in our view there’s really only one thing that really lets it down – the area of grey plastic covering the grille. 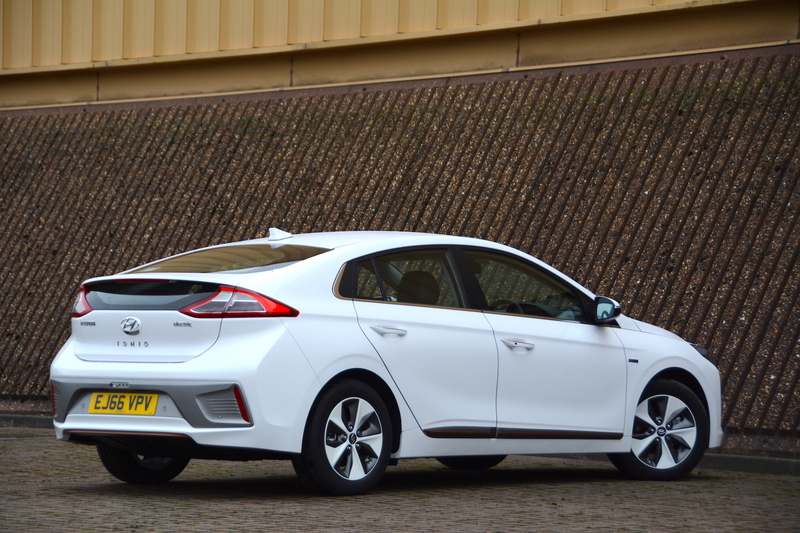 If Hyundai could improve on the front end styling, the IONIQ Electric really would be an excellent all-round car. In the meantime it retains its 9 out of 10 rating that it was awarded on its launch. Not a bad effort for Hyundai’s first all-electric car. Price: £26,295 (includes £4,500 UK government plug-in car grant).